On June 24, 2004 Christopher S. Cash, Company Commander of Alpha CO 1-120th Infantry, North Carolina Army National Guard, made the ultimate sacrifice while serving his country in Iraq. It is his legacy of giving to others that we strive to carry on in honor of his memory. Chris had many wonderful traits. His vibrant smile and contagious laugh are just two of many. He had a drive to help others and he loved serving his country. 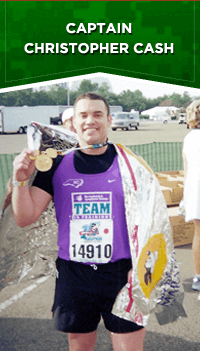 In his spare time he ran with Team In Training helping to raise money for Leukemia and Lymphoma cancer research. Now, thanks to your registration and/or donation, we are able to continue his legacy of giving. To learn more about our cause please visit the Captain Chris Cash Memorial Foundation of NC, Inc. The Captain Christopher Cash Memorial Foundation of NC, Inc. is a 501(c)3 and the federal id number is 26-2415415.